7-Month-Old Wakes Up Every Hour At Night - Help! Home > Baby Helpline > Baby Sleep Questions > 7-Month-Old Wakes Up Every Hour At Night – Help! 7-Month-Old Wakes Up Every Hour At Night – Help! I have a 7-month-old baby boy who really has never slept well. Lately, it has gotten worse. He already has four teeth, and I suspect another is coming through. I have given him Motrin, and rubbed Orajel on his gums, but he STILL gets up every hour. I don’t think he’s hungry, cold, hot, etc. I don’t think you are doing anything wrong! Some babies get unsettled very easily and wake often. It is exhausting for you. I know it is not much help, but he will grow out of it! Try to get a night where someone else is the person on baby duty so you get a decent night’s sleep. And make sure you nap in the day when he does if you can. You can also find other tips on how to maximize mom’s sleep here. When Mom’s get exhausted, we tend to get cranky, and of course baby picks up on that and gets worried and cries more! Just a possibility though, my son ended up being intolerant to dairy products, and the formula he was on after I stopped breastfeeding made him uncomfortable, and contributed to his sleep problems. Made a huge difference when I switched to a soy formula. Learn more about the signs of lactose intolerance here. The other thing, babies often have a headache! And when they lie down it hurts more. I have seen amazing changes in babies who have a couple of cranial osteopathy sessions. 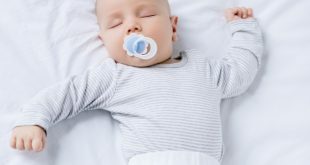 I don’t know if you have someone in your area who is specialized in working with babies, but it can make a huge difference for babies who don’t sleep well. Finally, being 7 months old, he may also be waking up due to separation anxiety. (Read about 7 month baby milestones here.) If he is sleeping far away from you, consider moving his crib next to your bed, or even moving him into your bed, if you are open to co-sleeping. A teddy or small cloth smelling mom may also help. Hang in there, and try to just be as calm as possible with him, if you are worried and stressed, he will be too! Thank you for the comment and suggestions. I work during the day, so napping when he naps is not an option. Are there any other signs/symptoms to tell if he has a dairy intolerance? I am stressed, but I also feel very guilty if I ask my husband for help. I wanted the baby more than he did, so I feel as though it is my responsibility. Don’t get me wrong- he loves our son, but I just don’t feel like I am able to ask him to take him for a night.